JIB GUN OIL & SOLVENT . 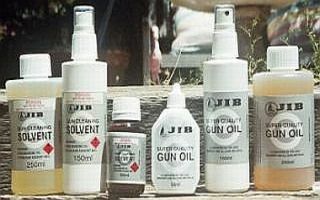 JIB Gun Oil & Cleaning Solvent is specially blended with top quality ingredients which dissolve powder residues, leading and rust, thereby ensuring your firearm remains in top condition. 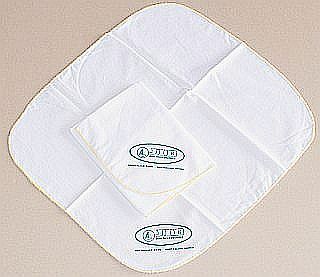 These products are available in different sizes depending on your cleaning needs. They are available in 50ml, 150ml Pump Spray and 250ml Bottles. A must for all your cleaning duties. 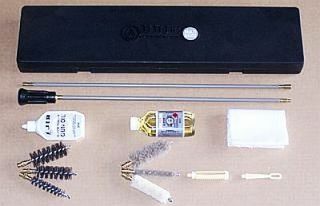 JIB STANDARD RIFLE CLEANING KIT . 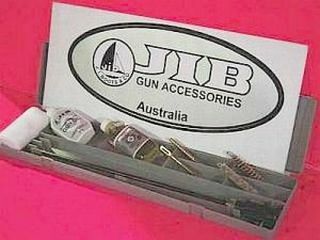 JIB Standard Rifle Cleaning Kits are available from .17 cal through to.45 cal. The kit consists of a Bristle Brush, a Wool Mop, Plastic Jag, Plastic Loop, 50ml JIB Gun Oil, 50ml JIB Solvent, a 2 Piece Standard Ball Bearing Rod and 1 Metre JIB Flannelette, packed for convenient storage and travel needs in a Plastic JIB Box. 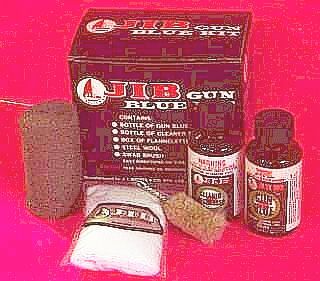 The JIB Standard Rifle Cleaning Kit is ideal for the novice or beginning shooter who only uses their rifle once in a blue moon and fires a couple of shots! JIB STANDARD MULTI-CAL KIT ..
JIB STANDARD MULTI-CAL KIT JIB's Standard Multi- Cal Cleaning Kit is ideal and practical for those who have more than one calibre of rifle to clean. The calibres in the kit are .22 cal, .30 cal and .45 cal. The kit contains 3 Bristle Brushes and 3 Wool Mops (one for each calibre), 2 Plastic Jags, 2 Plastic Loops, 1 Brass Adaptor (.22 to .30 cal), 50ml JIB Gun Oil, 50ml JIB Cleaning Solvent, a 2 Piece Standard Ball Bearing Rod and 1 Metre JIB Flannelette packed in a Plastic JIB Box for portability. JIB STANDARD MULTI-GAUGE KIT . JIB STANDARD MULTI-GAUGE KIT JIB's Standard Multi-Gauge Cleaning Kit is ideal and practical for those who have more than one gauge of Shotgun to clean. The gauges in the kit are 410, 20 and 12 gauge. The kit contains 3 Bristle Brushes and 3 Wool Mops (one for each gauge), a Plastic Loop and Plastic Jag, 50ml JIB Gun Oil, 50ml JIB Cleaning Solvent, a 2-Piece Standard Ball Bearing Rod and 1 Metre JIB Flannelette packed in a Plastic JIB Box. JIB PREMIUM MULTI-CAL KIT . JIB PREMIUM MULTI-CAL KIT The JIB Premium Multi-Cal Cleaning Kit is ideal and practical for the professional or advanced shooter who has more than one calibre of rifle to clean. The calibres in the kit are .22 cal, .30 cal and .45 cal. The kit contains 3 Bronze Brushes and 3 Wool Mops (one for each calibre), 2 Brass Jags, 2 Brass Loops, 1 Brass Adaptor (.22 - .30cal), 50ml JIB Gun Oil, 50ml JIB Cleaning Solvent, a 2 Piece Premium Ball Bearing Rod and 1 Metre JIB Flannelette packaged in a Plastic JIB Box. JIB STANDARD SHOOT GUN CLEANING KIT JIB 'STANDARD SHOOT' GUN CLEANING KIT JIB's 'Standard Shoot' Gun Cleaning Kit is available in 410, 16, 20 and 12 gauge. The kit consist of Bristle Brush, Wool Mop, Plastic Jag, Plastic Loop, 50ml JIB Gun Oil, 50ml JIB Solvent, 2 Piece Aluminium Covered Rod and a 1 Metre JIB Flannelette all packed in a Plastic JIB Box. The JIB Standard Shoot Gun Cleaning Kit is ideal for the novice/beginner shooter who only uses their shoot gun once in a blue moon and only fires a couple of shots. JIB PREMIUM BRONZE BRUSHES . 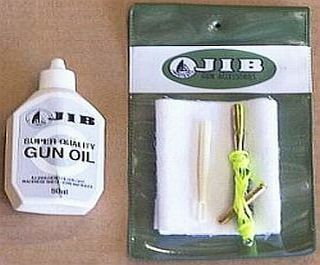 JIB 'Premium Shoot' Gun Cleaning Kits are available in 410, 16, 20 and 12 gauge. They consist of Bronze Brush, Wool Mop, Plastic Jag, Wire Loop, 50ml JIB Gun Oil, 50ml JIB Solvent, 2 Piece Aluminium Covered Rod and a 1 Metre JIB Flannelette all packed in a Plastic JIB Box. The JIB Premium Shoot Gun Cleaning Kit is ideal for the professional shooter for cleaning their gun both at the club and at home. A must for all professional shooters. JIB Premium Rifle kits are available from .17 cal through to .45 cal. They consist of Bronze Brush, Wool Mop, Brass Jag, Brass Loop (not supplied in the .17 cal Kit), 50ml JIB Solvent, 50ml JIB Gun Oil, 2 Piece Premium Ball Bearing Rod and a 1 Metre Flannelette all packed in a Plastic JIB Box. The JIB Premium Rifle Kit is ideal for the professional shooter. Easy to carry and place under the seat while out in the paddock shooting. JIB AIR RIFLE KIT . 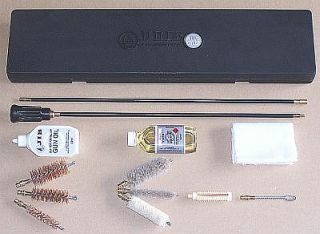 JIB Air Rifle Cleaning Kit is simple but practical kit to use. The kit contains a Bristle Brush, Wool Mop, 50ml JIB Gun Oil, 2 Piece Looped Rod in a JIB P.V.C. pack. Like all firearms Air Rifles need cleaning too. 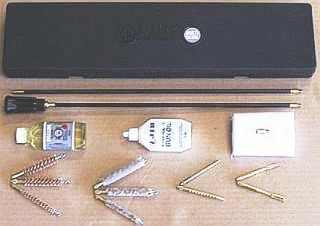 JIB PISTOL CLEANING KIT . JIB Standard Pistol Cleaning Kits are available from .22 cal through to .45 cal. The kit consists of a Bristle Pistol Brush, a Wool Mop, a Plastic Jag, 50ml JIB Gun Oil, a Standard Pistol Ball Bearing Rod and 1 Metre Flannelette all packed in a P.V.C. JIB Pouch. The JIB Standard Pistol Kit is ideal for either novice or beginner. A must for all pistol shooters. 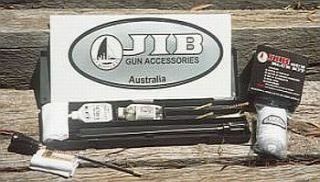 JIB STANDARD PISTOL KIT ..
JIB Standard Pistol Cleaning Kits are available from .22 cal through to .45 cal. The kit consists of a Bristle Pistol Brush, a Plastic Jag, 50ml JIB Gun Oil, a Standard Pistol Ball Bearing Rod and 1 Metre Flannelette all packed in a P.V.C. JIB Pouch. The JIB Standard Pistol Kit is ideal for either novice or beginner. JIB AIR PISTOL KIT . 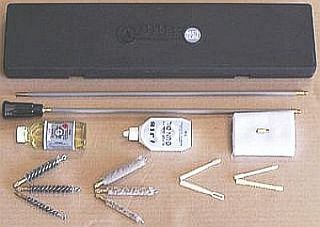 The JIB Air Pistol Cleaning Kit consists of a Bristle Pistol Brush, one Wool Mop, 50ml JIB Gun Oil, a Standard Pistol Ball Bearing Rod all packed in a JIB P.V.C. Pouch. The JIB Air Pistol Kit is ideal for beginner and professional pistol shooters alike. Essential for every shooter's box. JIB PREMIUM PISTOL KIT . JIB Premium Pistol Kits are available from .22 cal through to .45 cal. The kit consists of a Bronze Pistol Brush, Wool Mop, Brass Jag, 50ml JIB Gun Oil, Premium Pistol Ball Bearing Rod and a 1 Metre JIB Flannelette all packed in a P.V.C. JIB Pouch. The JIB Premium Pistol Kit is ideal for all professional pistol shooters. A must for every pistol shooter to have one in their box! JIB HUNTER’S POCKET KIT . JIB Hunter’s Pocket Kits are available from .22 cal through to .45 cal. They consist of a Pull-Through Bristle Brush, one Plastic Loop, 50ml JIB Gun Oil and JIB Flannelette packed in a JIB P.V.C. Pouch. The JIB Hunter’s Pocket Kit is ideal when out shooting in the field or bush. The kit can be placed in your pocket or fils easily into standard backpacks. Quick and easy to use. The JIB Aluminium 1 Piece Cleaning Rod is the ideal way for cleaning your shotgun. Covered with P.V.C Plastic, it is ideal for not scratching or damaging the shotgun barrel whilst cleaning. The Aluminium 1 Piece Cleaning Rod is perfect for cleaning 16, 20 and 12 gauge shotguns. JIB STANDARD 2 PIECE CLEANING ROD . The JIB Standard 2 Piece Cleaning Rod is ideal for those who have limited space when storing or carrying the Rod. Fitting easily into a backpack, the Rod is covered with P.V.C Plastic making it ideal for cleaning without scratching or damaging the bore. The rods also have a Ball Bearing Handle simplifying access to the rifling in the bore. The sizes available are .17 cal through to .45 cal. Irreplaceable for the novice or beginner to use for firearm cleaning. JIB STANDARD 1 PIECE CLEANING ROD . TheStandard 1 Piece Cleaning Rod is an ideal and practical product for the novice or beginning shooter. Covered in P.V.C plastic, the rod is ideal for cleaning without causing scratching or damage to the bore. The Ball Bearing Handle makes it easy for the brush to get inside the rifling in the bore. The sizes available are from .17 cal through to .45 cal. A must for all firearm owners. JIB PREMIUM 1 PIECE CLEANING ROD . JIB Premium 1 Piece Cleaning Rods are ideal and practical for the professional or advanced shooter who needs to clean their firearm frequently. The Rod is covered in P.V.C Plastic and is therefor ideal for not scratching or damaging the bore during the cleaning process. They also have a Ball Bearing Handle making them easy for the brush to get inside the rifling in the bore. Sizes range from .17 cal through to .45 cal. These rods fit easily fit into a Gun Case or Bag making them perfect for cleaning your firearm. JIB BRUSHES JAGS AND LOOPS . 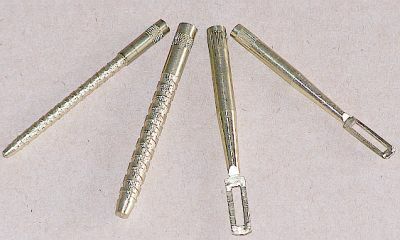 JIB Brushes are available in Bronze, Bristle/Nylon and Wool. We use the best possible materials available to ensure a perfect clean every time they are used. The brushes are available from .17 cal through to .45 cal for Rifles, 410, 16, 20 and 12 gauges for shotguns and .17 cal through to .38 cal for pistols . Our brushes are made on premises here in Australia to JIB's high quality standard. JIB Brass Jags and Loops are made from the best possible material available in Australia to provide many years use. The Jags are manufactured from .17 cal through to .45 cal and the Brass Loops from .22 cal through to .45 cal. 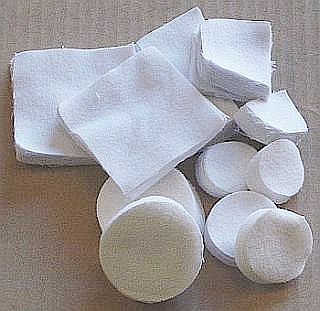 JIB has now introduced Cleaning Patches to our large range of Gun Cleaning Accessories. These Patches are available in both Round and Square according to individual preference. There is a range of different sizes available for all Rifles, Shotguns and Pistols. Check these out at you local JIB Distributor. JIB Flannelette is 100% Cotton / Flannel and comes in either a 4 Metre or 1 Metre Roll. The product is perfect and convenient for those shooters who want to cut their patches to their own custom size. 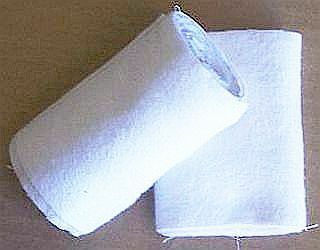 JIB GUN CLEANING CLOTH . Our JIB Gun Cleaning Cloth is a practical product, ideal for the daily cleaning of your firearm. Place it under your firearm while cleaning to soak up any spills. Use it to wipe over your firearm after cleaning. The JIB Gun Cleaning Cloth is 100% Cotton/Flannel and is a multi-purpose cleaning product, essential and versatile for cleaning any firearm ! JIB GUN BLUE KIT .. The JIB 'Gun Blue Kit' contains a 50ml Bottle of JIB Gun Blue, 50ml Bottle of JIB Cleaner Degreaser, 1 Metre of JIB Flannelette, a Steel Wool Pad and a Wool Swab Brush. The JIB Gun Blue Kit gives a professional type finish to all guns, making old barrels look like new again. Quick and easy to use ! JIB PREMIUM MULTI-GAUGE KIT .. The JIB Premium Multi-Gauge Cleaning Kit is ideal and practical for either the professional or advanced shooter who has more then one gauge of shotgun to clean. The gauges in the kit are 410, 20 and 12 gauge. The kit contains 3 Bronze Brushes and 3 Wool Mops (one for each gauge), a Plastic Jag, one wire loop, 50ml JIB Gun Oil, 50ml JIB Cleaning Solvent, a 2 Piece Premium Ball Bearing Rod and 1 Metre JIB Flannelette packed in a Plastic JIB Box.